Abstract: Cauda equine syndrome (CES) is a neurological condition caused by compression of the cauda equine. Here, we demonstrate a case of CES as the primary symptom of leptomeningeal metastases from non-small cell lung carcinoma without brain metastases. A 59-year-old male suffered progressive lower extremity motor dysfunction, urinary dysfunction, and lower extremity sensory dysfunction. He was clinically diagnosed with CES. 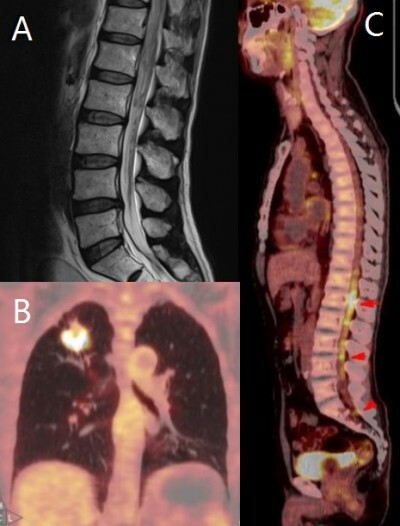 Nuclear magnetic resonance imaging demonstrated several vague nodules in the area of conus medullaris and cauda equine, without lumbar or thoracic herniated discs. The serum carcinoembryonic antigen concentration was 191.20 ng/mL. The conclusion following positron emission tomography–computed tomography was a right upper lung malignant tumor with mediastinal lymph node metastasis and cauda equina metastasis. Pathologic diagnosis was of primary adenocarcinoma of the lung by bronchoscopic biopsy. EML4–ALK fusion and EGFR mutations were absent, and thus the patient received chemotherapy. However, symptoms of intracranial hypertension arose 1 month later, and the patient died 3 months postadmission. Emerging CES may be a sign of metastasis of a malignant tumor, presenting an extremely challenging condition, especially for patients with lung cancer. Positron emission tomography–computed tomography is a fairly effective technique to make the diagnosis.